There’s little more than no aroma on the liquor that i can detect. The tea pot smells like… some semi-industrial Chinese village’s marketplace? o.0;; I’m thinking that’s because Three Flower Burst Tea is being reviewed last and i brewed five of these Display Teas in one day. It actually tastes like half-part jasmine (and the caffeine content is so high i developed an instant migraine) and half-part osmanthus. Unfortunately, the lily isn’t something i can discern. The flowering bulb has a huge osmanthus blossom and a chain of four yuri-chained lily buds. It’s very cute. Also the hand-tied leaves seem to unfurl better than most Display Teas. Not bad for something that barely qualifies as tea in my mind. Three Flower Burst Tea (Eli): loose leaf by Jocilyn Mors is licensed under a Creative Commons Attribution-ShareAlike 4.0 International License. 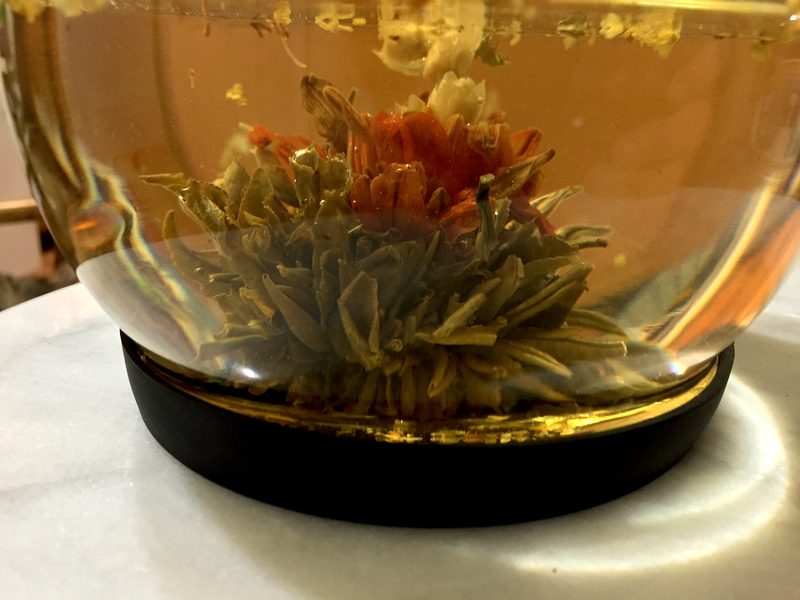 Three Flower Burst Tea (Eli): on Display A by Jocilyn Mors is licensed under a Creative Commons Attribution-ShareAlike 4.0 International License. Three Flower Burst Tea (Eli): on Display B by Jocilyn Mors is licensed under a Creative Commons Attribution-ShareAlike 4.0 International License. Three Flower Burst Tea (Eli): liquor by Jocilyn Mors is licensed under a Creative Commons Attribution-ShareAlike 4.0 International License.